Cameron is a clinical research professional with 29 years of industry experience, including working with sponsor and CRO companies. He spent 8 years as a clinical trials manager and project manager of clinical studies based in the USA and internationally. Therapeutic area focus has been oncology for the past 6 years. Prior to that, he spent 7 years working in Women’s Health. Other areas included cardiovascular, infectious disease, and organ transplantation. Cameron has managed multi-disciplinary project teams across the entire spectrum of clinical research. He participated and managed functional areas for the successful FDA submission and approval of new medications including Tacrolimus, Delavirdine, Pravastatin, and Fosinopril. 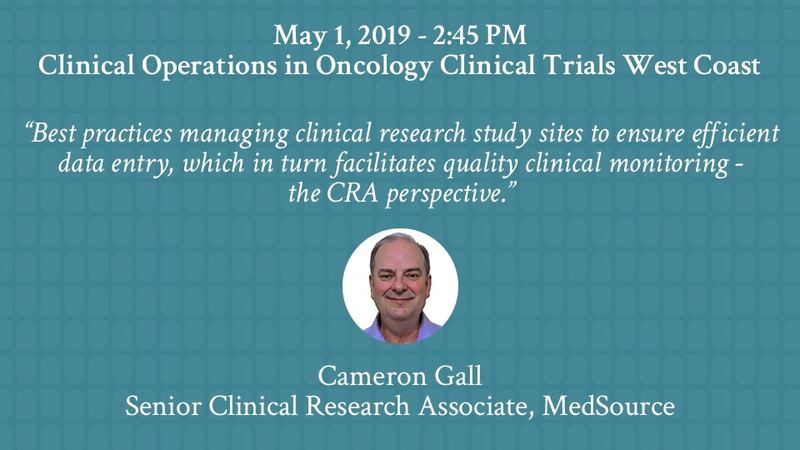 His current position as Senior CRA allows him to focus on his primary professional interest in facilitating the delivery of quality data for important ground-breaking therapeutic oncology projects. Meet MedSource at the conference to learn about our strong expertise in oncology, neurology/CNS, rare/orphan diseases and other areas of therapeutic areas. We have participated in more than 700 clinical trials globally. Of our therapeutically focused studies, more than 60% of those clinical trials were in oncology. From our founding as an oncology-focused CRO to holding one of the industry’s seasoned oncology clinical teams today, we are trusted to run challenging oncology trials. Schedule a meeting with MedSource at the conference to learn more by submitting the form below. To schedule a meeting with MedSource, please complete the form below.